would it be possible for you to add a loop function to your addon that we can toggle ? To add Gambahl (Autumn Harvest Prime attractor) as an attractor minion, add this line at the end of your Rift/Interface/Addons/MinionSender/lua/data/minion.lua file, before the closing bracket. My Minion Sender main "circle" has disappeared (where we click to send and claim). I tried disabling and re-enabling the addon. I also uninstalled and reinstalled. I've tried left-clicking and right-clicking the mini-circle icon, but nothing has helped. the /minsnd reset command fixes this. While mousing over the round UI thing to get the dropdown menu that shows all minions you have, 2 of the icons show up as a "Diplomacy" icon, and there is no "air" Icon. how do i move the little button to the side of my screen? Thank you, worked very well. Any chance of a similar line for Jolly Hellbug? Is there a way to stop Minion Sender from rolling back to a previous setting when the game crash? The game isn't exactly stable these days,and everytime it crashes it puts my minion sender to a previous setting. Say I wake up (was doing 8 hours mission during the night), I put it back to 5-15 minutes mission... Then the game crash, I hop back in and it's back to 8 hours mission. So if I don't think about changing it and click it real fast it just sends my minion into 8 hours missions. I'd like to know if there would be a way that when I put a setting in it's saved permanently (until I change it anyway) so whatever happens it wouldn't rollback. All addons save only on UI reload. If you make changes you want to ensure are saved, use /reloadui when you're done changing things. I often have to do this when modifying kalerts. Any chance of an update at some point to fix newer attractors being recognized? Opie in particular is a genuinely important one to be able to use with minion sender. EDIT: Look up, I posted the fix needed to make this happen. Save the "default mission state" immediately after sending a minion. Alternately, save every 10-15 minutes perhaps? Sometime other than when closing the client. that also saves all the changes in addon settings and your minion sender selected rule set and new equipment sets made with gadgets: outfitter and somesuch. How do you delete a rule from a rule set? I can't get advanced mode to work with the latest version (1.6.6). In simple it is fine, and collecting is fine. It just doesn't send... I can send you my settings file, but below are the screenshots of the two settings I use. You need to setup stat matching for each advanced job rule. Expand the individual rule and choose from 'Without Matching', 'Match one stat' and/or 'Match two stats'. 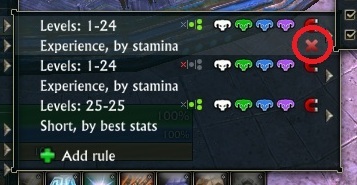 The update tweaked these and left each rule with all three empty which will cause it to fail the check and not execute. That seemed to work this time. Thanks!